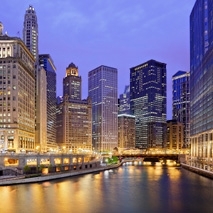 Quarles & Brady opened its Chicago office in 1999 by acquiring a long-established, 25-person general practice firm as a means to advance the national growth aspirations of both organizations. The lawyers who have since joined the Chicago office have built a close-knit group of more than 80 attorneys who share in the firm’s core values, clear vision, and comprehensive strategic plan, but recognize the individual tactics required to succeed in Chicago, which boasts a robust business and professional environment and is the corporate headquarters to more than 100 Fortune 500 companies, second only to New York. With more than 77 neighborhoods, Chicago is a tapestry of cultural history. Whether you find yourself on the north, south, east, or west side of the city, the richness of this multicultural city ensures something for everyone. While exploring the city’s north side, you will find the small-town European charm of Andersonville. Its strong Swedish-American roots are represented at the Swedish American Museum Center. Not far away, immigrants from Germany, Greece, Eastern Europe, and Mexico settled into the neighborhood of Lincoln Square, which proudly displays its heritage through public artworks and architecture. Have a taste for Indian, Jewish, or Middle Eastern food? Enjoy the restaurants of the Devon Avenue neighborhood, where Chicago’s Indian and Pakistani communities, along with Jewish and Middle Eastern communities, live and work side-by-side. The city’s south side can give you insight into African-American heritage by exploring historic Bronzeville, the DuSable Museum of African American History, Jokes and Notes, and the Bronzeville Children’s Museum. Be inspired by the art and culture of today’s youth by visiting The Little Black Pearl Workshop, located in the Kenwood/Oakland neighborhoods, or savor Chinese cuisine while strolling through the streets of Chinatown. On the city’s west side, Humbolt Park was originally home to Norwegian, Swedish, German, and Jewish families, and now has become home to a vibrant Puerto Rican community. Stop at this neighborhood’s Institute of Puerto Rican Arts and Culture to learn about all the contributions Puerto Ricans have made to their broader communities. West Town is composed of the East Village, Bucktown/Wicker Park, Noble Square, Eckerhart Park, and the Ukrainian Village neighborhoods. While Bucktown/Wicker Park is home to many Chicago artists, many of whom are featured at the Around the Coyote arts fair, the Ukrainian Village features numerous ornate orthodox cathedrals and The Ukrainian National Museum. Celebrate Latino heritage, culture, and some of the best tacos for miles around with a visit to Pilsen and Little Village, on the lower west side. While you’re there, visit The Mexican Fine Arts Center Museum, which showcases the nation’s finest collection of Mexican art. Chicago has many opportunities for recreation. With over 7,300 acres of parkland, 33 beaches, and 10 bird and wildlife gardens, the city is filled with endless opportunities for outdoor activity. Visit Millenium Park to experience world-renowned landscaping and architecture. “Loyal” is the best word to describe the avid Chicago sports fans. Whether they are watching the Cubs at historic Wrigley Field, catching a Bears game at Soldier Field, or taking in a Bulls, White Sox, or Blackhawks game, Chicago fans are always there to root on their favorite teams. There is so much to experience in Chicago that it is difficult to list it all. To name just a few examples, explore the Shedd Aquarium, Adler Planetarium, and the Field Museum of Natural History for an educational experience for all ages. Shop the Magnificent Mile, or climb to the top of the Willis Tower or the Hancock Tower to see a bird’s-eye view of the city. Visit the Art Institute or Museum of Contemporary Art, and enjoy a concert with the Chicago Symphony Orchestra or Lyric Opera, all in one day! If you still have some energy, discover where Jazz began at the Jazz Institute of Chicago, and tap your foot to whoever is playing at the famous House of Blues. You also cannot miss out on all the great activities and festivals that Chicago has to offer in the summer. Visit Chicagotraveler.com, www.chireader.com, http://www.cityofchicago.org/city/en.html, or www.metromix.com to learn more about what’s happening in this dynamic Windy City.